Raise your hand if you’ve ordered Chinese takeout in the past week. Whatever your reason for loving the stuff, I bet you’ve thought to yourself many times that you could probably make it at home, saving you both the money and the extra calories. 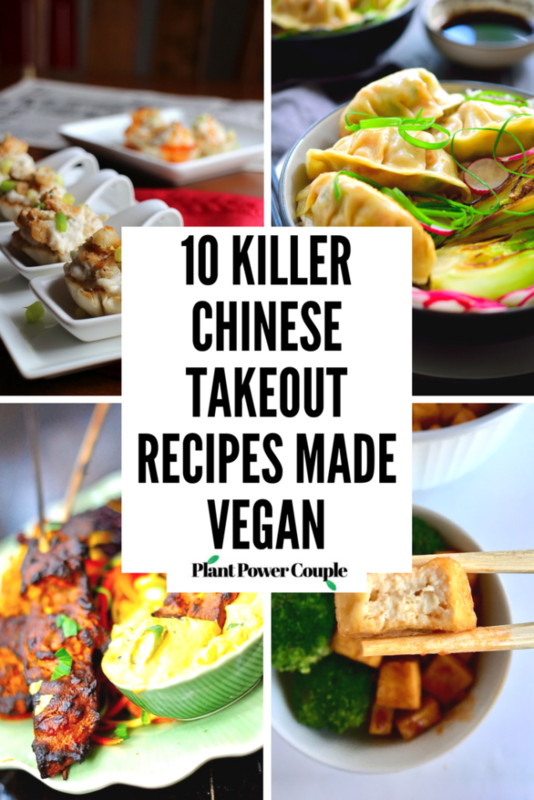 And if you’re vegan, although the Chinese takeout menu is generally a place where you can find a decent list of already-vegan options, there may be some items that they don’t offer in a vegan version, and those moments are where I’m hoping this list will come in handy for you. Let’s start with an easy appetizer, shall we? I love this quick & easy veganized crab rangoon by Cadry’s Kitchen. 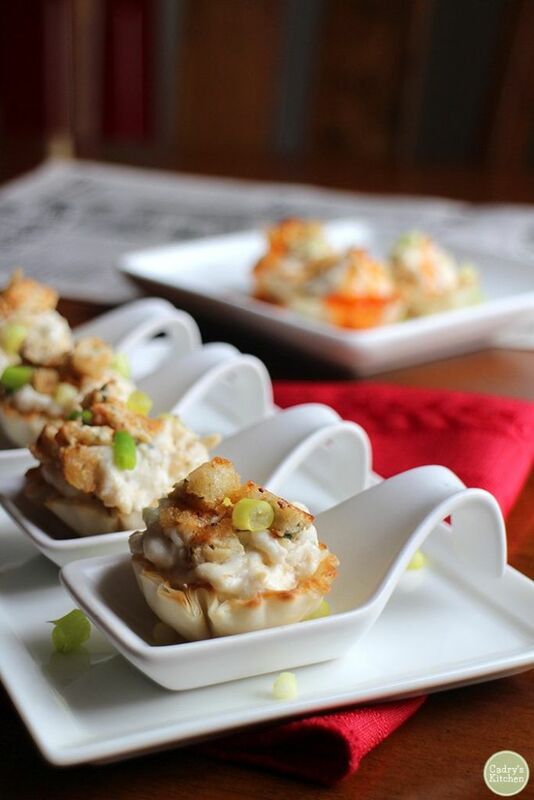 It would be great for a party appetizer when you’re running low on time and looks pretty spectacular. I mean, right? And you know it’s gotta be good because the recipe calls for Gardein’s crabless cakes, which are pretty outta this world. If you’ve never tried them, this recipe is a great opportunity. This one has definitely gone on our MUST MAKE ASAP list. 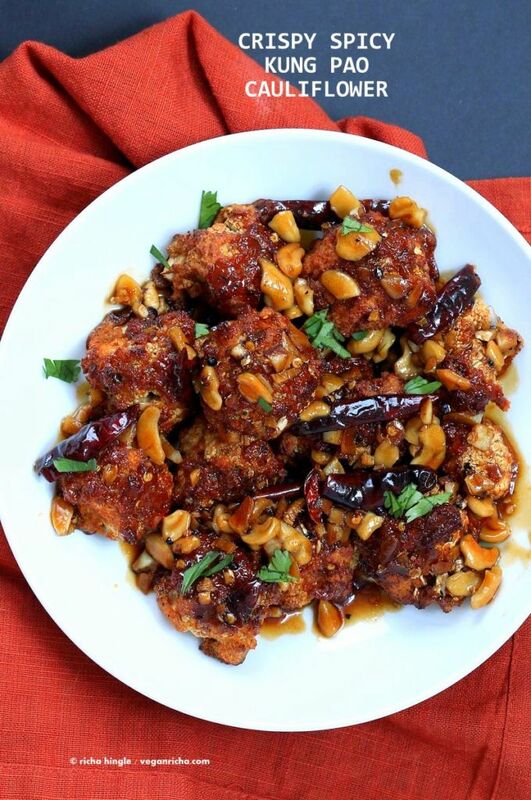 I love Vegan Richa recipes, and this Kung Pao Cauliflower is no exception. If you’ve fallen in love with the recent cauliflower buffallo wing trend, this dish is a great new twist for you to try. Bonus points: This recipe can be made gluten free if you use gluten-free breadcrumbs. Score! Okay, this idea is GENIUS. 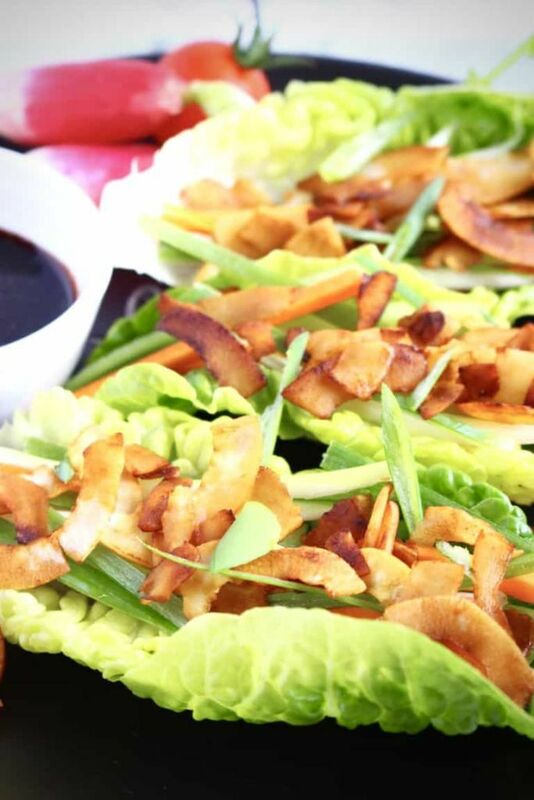 Rhian’s Recipes used a modified coconut bacon recipe to make these crispy vegan duck lettuce wraps. I have never thought of this before, but now we’ve gotta try it! This looks like a great and light appetizer for the warmer weather we have headed our way in the coming months. I looove getting deep fried tofu from Chinese takeout places. The first time I had it, I was shocked because I had no idea tofu could taste that good! Then, when I learned you could create that same deep fried effect with an air fryer, I was so on board. That’s how we made this Sweet Sriracha Tofu recipe! 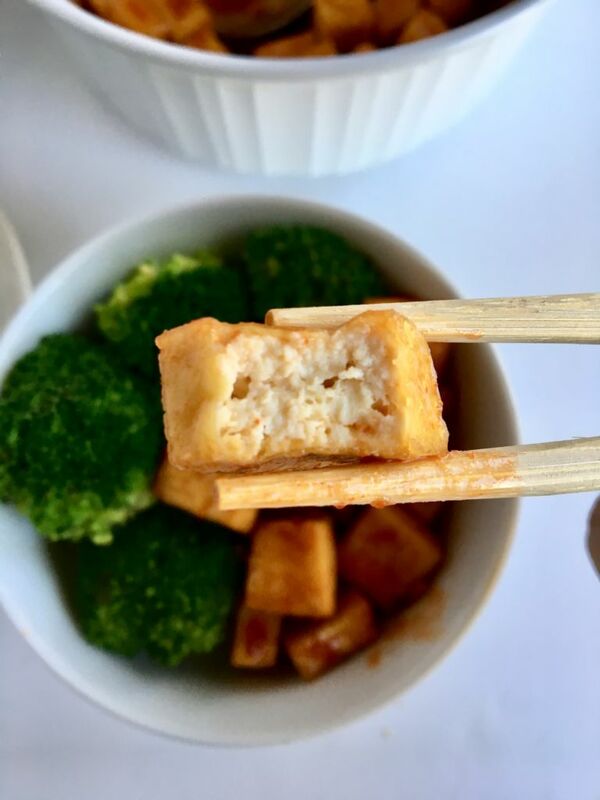 It’s so fast and easy which makes it a great weeknight dinner – you just cube and toss your tofu into the air fryer and smother it in a sweet & spicy sauce that is simple but ohhh so delicious. I’ve seen about a million recipes for jackfruit on these here interwebs, but none of them have been quite as creative as this Sticky Chinese Jackfruit recipe by What She Ate. For starters, she doesn’t shred the jackfruit like one would for a “pulled” texture. Instead, this jackfruit is coated in rice flour and seared in hot oil before being coated in a thick, tasty sauce. Pretty cool and definitely a method we will be trying in our own kitchen soon! 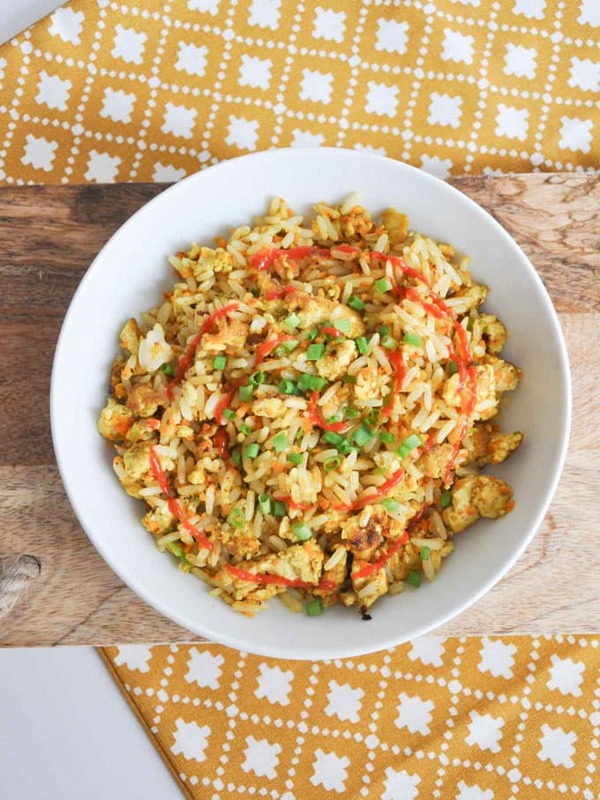 I used to obsess over egg fried rice in college, so this one is pretty exciting to me, and interestingly enough, using tofu in my veggie fried rice never occurred to me until I read this post, but you can bet I will definitely be giving this one a go. 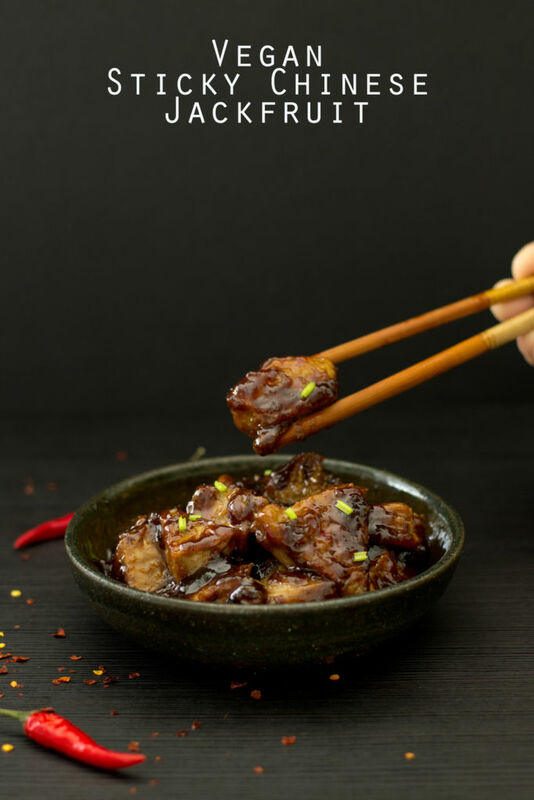 When I first saw this recipe, I wasn’t exactly sure what “satay” was, but after reading the post, I now know this recipe is basically a kickass vegan version of my all-time favorite item on the Chinese takeout menu: CHICKEN ON A STICK! I can hardly contain my excitement with this one. I even grabbed all the ingredients the other day and plan on making it soon, so definitely look for a review of that in our IG story over the next week. But until then, I’m gonna trust that this recipe is going to change my life, and yours too. I mean, it’s vegan chicken on a stick, you guys! But now that I know, I’ll definitely be trying this homemade version! You know we had to finish with dessert, and what better dessert from your local Chinese takeout place than those killer carnival-in-your-mouth Chinese doughnuts? 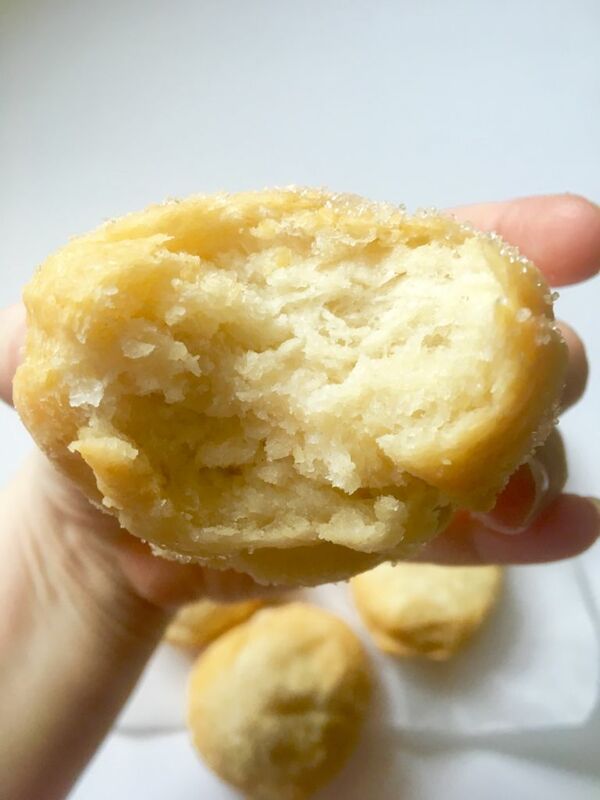 This recipe can be made in either the deep fryer or the air fryer, the decision is up to you! But whatever you make from this list, be sure to finish it with one or two of these bad boys, and I promise you won’t regret it! 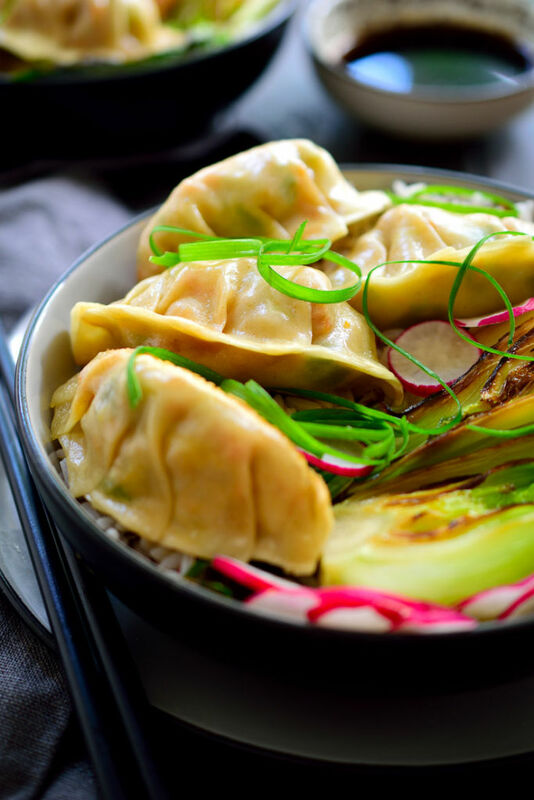 The next time you’re craving takeout but have the time and energy to cook it yourself, why not give one of these recipes a try? They’ll be a lot easier on your wallet and will definitely be healthier than ordering. Plus, maybe it’s just me, but there’s no greater feeling than sitting down to a dinner I cooked myself. Maybe it’s the sense of accomplishment or artistic fullfillment I feel (Oh boy, didn’t mean to get so deep about this), but every time I get in that kitchen, it feels like I’ve cracked a secret code, especially when I make a vegan version of something I loooved as an omnivore. Until next time, Plant Power People! Wow! This round up is going to come in handy. I used to LOOOVe egg friend rice, and crab rangoon and ...and ....oh my gosh all of these. 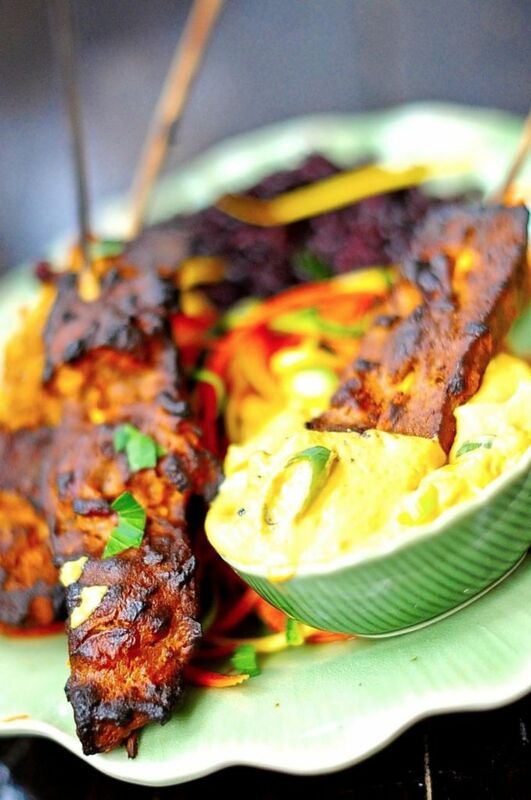 Thank you for including my Satay recipe. Right?! After looking at this list, I'm thinking it's time for a homemade takeout party. :) Your satay recipe is so wonderful! I was literally jumping up and down when I read the post, love (vegan) chicken on a stick! Could these recipes look any more delicious? I'm a sucker for potstickers! Oh my gosh! What a great idea for a round-up. I love Chinese take-out. Can't wait to try these. Especially that seitan one! Oh my gosh, this collection made my mouth water! Everything looks delicious! Yay! :) Thanks so much! Oh goodness me, I'm salivating now after looking through all these beautiful recipes! Such a great collection of delicious vegan food! Oh, all these look so yummy- you are making me hungry! 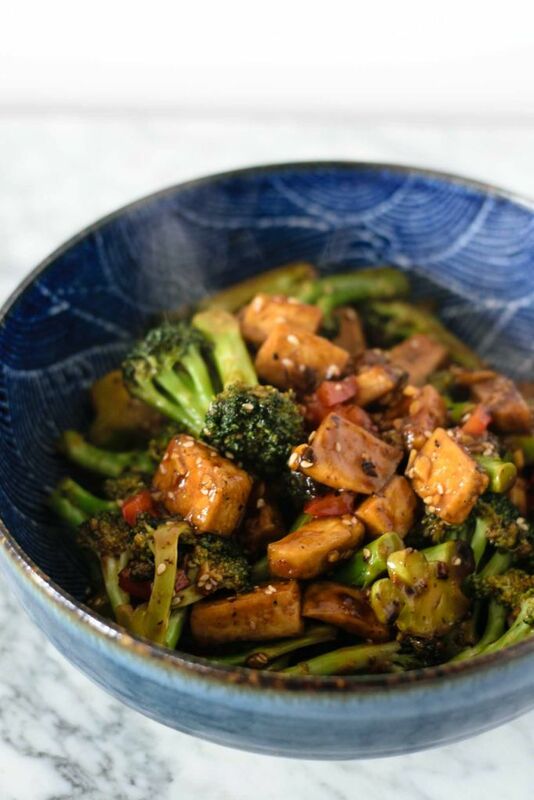 Great roundup of vegan Chinese recipes; it really shows how easy it is to go vegan and still enjoy classic dishes. Yum! My favourite Chinese takeout item is Szhechuan green beans, but they're pretty easy to veganise. :) I imagine they'd go so well with that kung pao cauliflower. I'm so hungry now, haha. 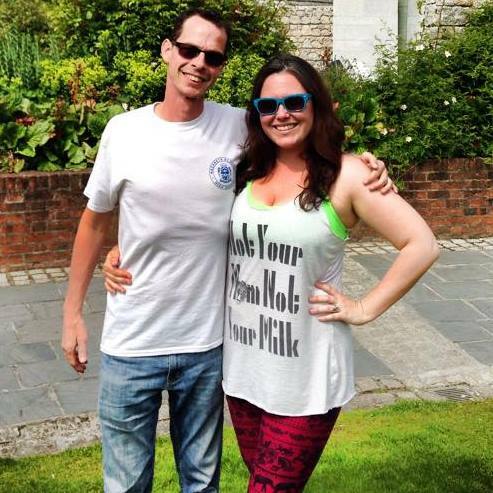 Ooooh, that pairing is a great idea!